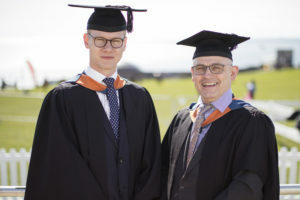 PYNDA committee member Nic Ingle attended the University of Plymouth graduation ceremony on 19th September held on the Hoe to present the two PYNDA prizes to both the winners. 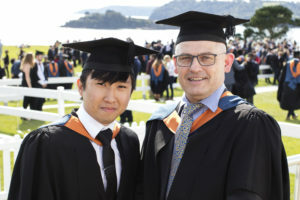 The winner of The PYNDA Prize for the Best Maritime Business and Maritime Law Dissertation was Andreas Hjelle and the winner of The PYNDA Prize for the Outstanding Performance in Maritime Business and Maritime Law was Wayne Ng. Both Andreas and Wayne are pictured with Nic on a sunny Hoe after a ceremony attended by over 1,00 proud parents and students.